The opening salvos from the WAEA (Now APEX) were as expected with virtually every speaker mentioning or displaying iPad-isms. Marketing and futurist, Sarah Davanzo, as keynote speaker opened the conference with her separating the consumer into “eggs” and “snowflakes”. At odds, the two crowds are diametrically opposed, much like extraverts and introverts. At last I found out that I am an “egg flake” because energy drinks and coffee move me from the passive mood to an active one. Sarah may not agree. And speaking of mood, the next thing is a marketed mood stage. The best take-away was the so-called “cathedral effect” that causes newbies to a building or plane to “look up”. It seems that designers are setting a mood stage on an airplane when they add LED soothing lights or projected clouds and stars. Think of the value of this to teenagers in auto backseats! The portable media player sessions were another source of ‘wonder and excitement’. We all wondered why a few declined to be there and were excited by the statements of the ones who were. The “iPad” word was bandied about by the Stellar representative but we must tell you that we did not really understand, or for that matter, believe what he said. Stellar is employed by Jetstar Airlines to get the iPad and conent on their aircraft. Phantom Media/Blue Box started this initiative six months or so ago. But there was a brouhaha and they got in a bit of hot water over their claim of “studio early window” approval. As far as we can tell, here is the view from those who know: 1. Apple doesn’t give a hoot about IFE…they sell millions and will continue to do so. IFE, today, is a niche market. 2. The only way to really insert early window, encryption and decryption software into an iPad with limited Apple dev kits, is to “legally” jailbreak it. Of course, one can “non legally” do the same, probably, but will studio content hackers bless it enough for early window content? One source says 5 out of 6 studios have not approved and they were even sure of the supposed one that did. In reality the real question is the early window release going to remain. Certainly no, one guru told us. Further, what’s the point of all this early stuff when studios are down to a few weeks on their early release exclusivity and airlines use up half of that time during the content encrypt and upload process. Keep an eye on this one iPad watchers and don’t forget that within a few months there will be a whole mess of Windows and Android handhelds out there. 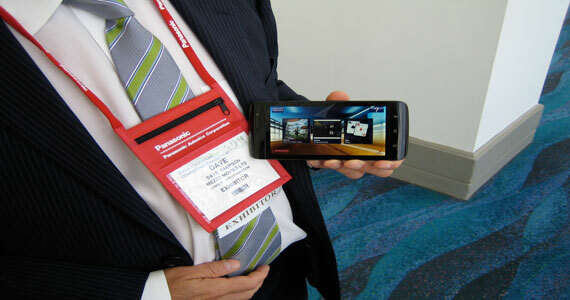 Installed IFE is on a crash course with the handheld market. Period! Dave Sampson, Mezzo gave us a quick course on the Mezzo rewire. Check out their website. It seems that they have become platform agnostic, while still supporting their eDigital units. Sounds like the right move to us. And by the way, here is a quick pic of the little Android baby he was toting in his pocket. Looks like a Dell PMP to us, and it really has a GREAT screen. Boy, things rate getting interesting and more interesting by the minute.